35 step-by-step projects for gorgeous Gothic jewelry. Inspired by classic gothic literature and movies, Harriet Smith's jewelry fuses dark beauty and humorous horror imagery - and here she shows you how to craft 35 of her distinct and striking pieces. Each project is suitable for beginners to jewelry-making with all the techniques clearly explained. The materials and tools used can be found in many craft, DIY and homeware stores or located on the internet - and there are often alternatives to be found in the kitchen tool cupboard or an old toy chest - so there is nothing to stop you making them in the comfort of your own home. Make the skull earrings, bones bracelet and dead flower corsage from the 'Fabrics and Fimo' chapter; in 'Beading and Metalwork' there's a Gothic cross necklace, Sweeney Todd earrings and a barbed wire bracelet; and you can have fun with the designs in the 'Plastics' chapter - including a bat brooch and bottle-top cameo bracelet. 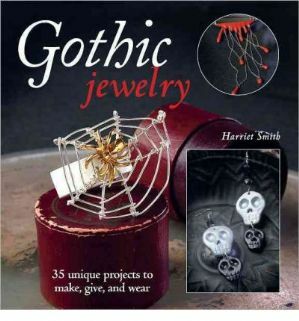 Harriet's gothic jewelry isn't just for Goths - her pieces have wide-ranging appeal, are easy to make and fun to wear, and make a truly unique gift.